So….what does it mean to me? I have to be comfortable enough with my content, inside and out, that I can have the ability to know where quality infusion of technology would benefit my students. In addition...the resource of time is definitely underplayed in this article...having the time to explore new technologies, or how current technologies are being used by other teachers successfully, takes up an enormous amount of time. 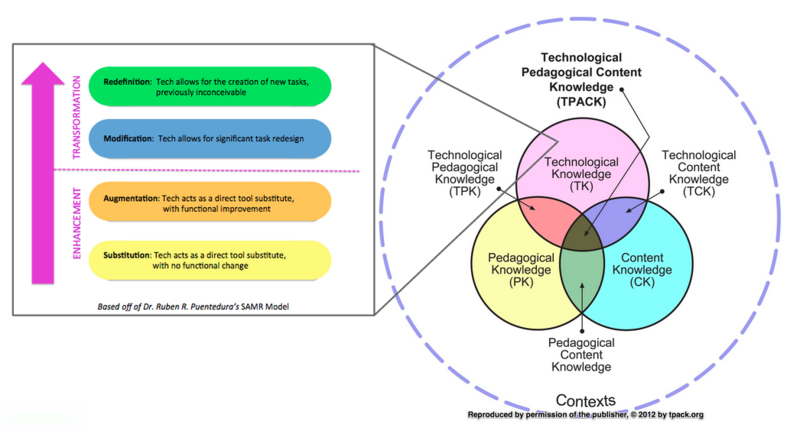 A couple of things I was reminded about when exploring TPACK and SAMR was that technology changes our pedagogy (how we teach) and our content (what we teach). Using the TPACK model as a reference, I feel very confident with my CONTENT knowledge. I’ve been teaching high school or middle school math for 14 years, and even though the content has changed several times, I’m very comfortable with my standards and what I teach. I’m also very happy with my PEDAGOGY, my teaching strength is my relationship with my students, but I’m always looking for techniques and strategies to add to my PEDAGOGICAL toolbox. Definitely my weakest ring in the TPACK model is my usage of technology, and designing lessons that incorporate the “magic middle” of the TPACK model. The two areas I will continually explore and improve most upon are the TCK (technology/content knowledge) which is making sure that the content my students access through websites, games, apps, etc. is of high quality, and the TPK (technology/pedagogy knowledge) which is how I use technology in my content area for deep and lasting learning. These sound like simple ideas when you just type them out, but in fact, these are huge, time consuming feats. Upon watching the TPACK and SAMR videos, it made me reflect on the idea that it would be nice if there were some sort of TPACK/SAMR checklist of questions that teachers could answer to reflect and answer whether the technology a teacher has designed into their curriculum is in the “magic middle” of the TPACK model, or in the upper two “transformational” levels of the SAMR model.